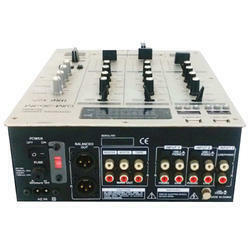 Providing you the best range of djm-363m pro 3-channel dj mixer with effective & timely delivery. Professional 3-channel ultra low-noise DJ mixer with additional Mic input and earphone monitor. Built-in fully independent double channel USB player. Super-smooth ULTRAGLIDE faders with up to 500,000 life cycles. VCA fader engines for utmost reliability and smooth audio performance. Dedicated curve control for all faders. Awesome adjustable XPQ stereo surround effect. 3-band kill EQ(-20dB),gain and balance control per channel. PFL function with CH-1/CH-2/CH-3 balance control. Precise master/cue level meter with peak hold function.